NRDC is calling on EPA to re-examine the widespread use of glyphosate, commonly called Roundup, in light of its impacts on monarch butterflies. Glyphosate was last approved by EPA in 1993 before the adoption of genetically modified crops that are tolerant to its use, known as “Roundup Ready” crops. Now, however, Roundup Ready corn and soy dominate the agricultural system and the use of glyphosate has skyrocketed tenfold to 182 million pounds annually. As a result, milkweed – which is the sole food source for monarch butterfly larvae – has all but been eliminated from farm fields across the Midwest. At the same time that spraying of glyphosate has soared, the monarch butterfly population has been plunging. This winter the population at their Mexican wintering grounds fell to just a tenth of its running average, to 33.5 million, and acalamitous drop from a high of one billion monarchs in 1997, the year after the first Roundup Ready crops were introduced to the market. Because of this alarming decline, researchers this year declared the monarch’s migration is at “serious risk of disappearing.” This means we are in danger of losing, in just a few short years, a marvel of nature that has existed for millennia. The monarchs’ annual flight from a tiny area of Mexico to as far as Canada and back, all in a single season and spanning several generations, is a unique phenomenon still mysterious to science. Now that we know that glyphosate is having a devastating impact on one of the world’s most spectacular natural wonders, it’s time to restrict the pervasive use of this and other weed-killers. The EPA has the authority to conduct an urgent review of any herbicide and impose restrictions to address its adverse impacts. That’s why NRDC has filed a petition asking the EPA to undertake such a review of glyphosate and develop measures that would reduce its impact on monarch populations. Some of the measures we propose include preventing use of glyphosate and other weed-killers along highways and power-line rights of way where milkweed, a relatively short plant, could grow freely without interfering with maintenance or emergency crews – and requiring farmers to establish herbicide-free safety zones in or around their fields, or create other milkweed-friendly habitat. And we encourage the agency to explore other safeguards to protect monarch habitat from glyphosate and other herbicides. The devastation of the monarchs is a disheartening example of the many unintended consequences we suffer from the industrialization of the agriculture system. By taking steps to save the monarch, we must also take a hard look at the wider impacts of our current land use and farming practices. There are several other herbicide-resistant crops in line for approval that will only further contribute to the loss of milkweed and other native plants that pollinators depend on unless we build in appropriate safeguards. Though seemingly delicate, monarch butterflies are remarkably resilient and their decline can be reversed – but for that to happen we must find a way to make a little room for the very plant that they need to survive. 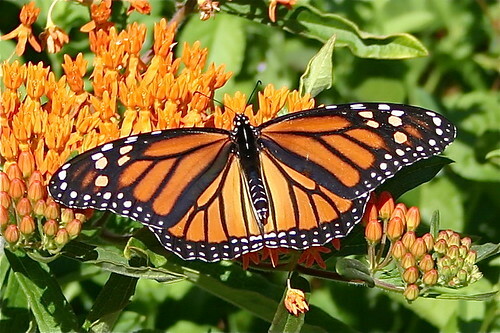 To help NRDC and our partner MonarchWatch plant milkweed please visit our Green gifts. Photo credit: Kim Starr for Caterpillar and Sherri VandenAkker for Butterfly. This entry was posted in News and tagged EPA, glyphosate, GMO, monarch, monarch butterflies, NRDC. Bookmark the permalink. Follow any comments here with the RSS feed for this post. Post a comment or leave a trackback: Trackback URL.